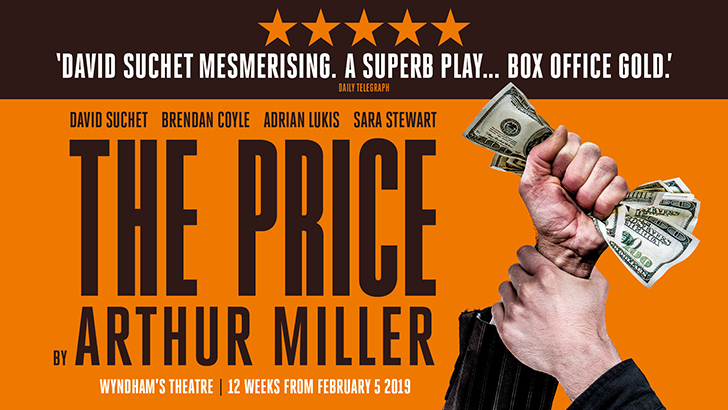 David Suchet delivers a comic tour de force as a silver-tongued 89 year old furniture dealer in Arthur Miller's 'masterpiece' (Daily Telegraph), THE PRICE. He is joined by Olivier Award winner Brendan Coyle (nominated for BAFTA and Emmy Awards for his acclaimed role as Mr Bates in Downton Abbey) who plays Victor Franz. Adrian Lukis plays Walter Franz and Sara Stewart plays Esther Franz, Victor's wife. Inspired by the grand cafés of Mittel-Europe, The Delaunay is an all-day café-restaurant from Corbin & King; the team behind The Wolseley. Offering a varied selection of classic European food and located within a short walk of Wyndham's Theatre, it is perfectly placed for enjoying a meal before or after either a matinée performance or indeed an evening show. Please Note: Customers must reserve a table at The Delaunay. Please call 020 7499 8558 or email reservations@thedelaunay.com and quote 'The Price offer'. *Valid for Monday - Thursday performances until 18th April 2019 only. This 2-course dinner at The Delaunay is valid on the same day as the performance only and only valid when purchased in advance as part of this package. Maximum table size of 4 people - The Delaunay cannot guarantee that larger parties will be seated together. For more information please call 020 7499 8558 or email reservations@thedelaunay.com quoting 'The Price offer.' Please bring your meal voucher to present at The Delaunay, which you will be sent when you book. Guests must be seated at The Delaunay no later than 5.45pm for pre-theatre and by 10.45pm for post-theatre. Drinks (apart from tea and coffee) are not included in this package. Anything ordered outside of this set menu will be charged as normal at the end of your meal. Please note that tables may be subject to a time restriction. Subject to availability.